Anyone in Ketchikan who knew Paul Wingren, the late, legendary groceryman, wasn't likely to forget him! That was especially true if you were one of the youngsters from years way past who got caught when trying to swipe empty pop bottles from crates near the rear of his store in order to trade them in at the front cash register for their nickel deposit value! Wingren had quite a reputation, too, with many of the young trainee clerks or cashiers who worked in his stores over the years. "There are a lot of people in this town who worked for me over the years, successful businessmen now, some of them," Wingren once mentioned in an interview. "Well, I'm the s.o.b. who taught 'em how to work!" Work ethic was big in Paul Wingren's eyes. "When I broke into the grocery business as a boy way back when, we were paid by the week not by the hour - and the day ended only when all the work was done!" He always shared his memories. "To this day,' he said proudly, not long before his death in 1989, "I have my forty-hour week in by lunchtime on Wednesday!" Wingren's plans and accomplishments for this community he called home were apparently so many and so varied, that they are taken for granted and some are rarely recognized. Anyone who moved to Ketchikan more recently than, say, thirty years or so ago doesn't know what today's Tongass Avenue's mall area was like "back when." The waters of Tongass Narrows lapped against the shoreline so close to the street along there that a good sou'easter in a heavy rain could blow a surge of water right onto and across the street! It was Paul Wingren who started the fill process for the big mall area ­ little by little at first as he could afford it, later ­ with financing - to make it what it is today. And the mall itself: Port West has its initials PW on its main entrance façade. Hmmm, interesting. Those are Paul Wingren's initials, too! Wingren, also a devoted family man, was voted "Mr. Ketchikan" in 1987 when he was named Citizen of the Year by the Ketchikan Chamber of Commerce for having been active in Ketchikan business affairs for more than half a century! Wingren was born into the large Scandinavian population of La Conner, Wash., Sept. 15, 1908, the cute little blonde son of Olaf and Tillie Wingren, both immigrants from Sweden. His father died when Paul was only nine and later his mother remarried. His stepfather was a fisherman who fished in Alaska on the troller Hope. So Ketchikan was not a "foreign word" in the little boy's vocabulary. Wingren thought that old troller was still up here, somewhere. Paul started work at a young age in his first serious job -- in a grocery store. 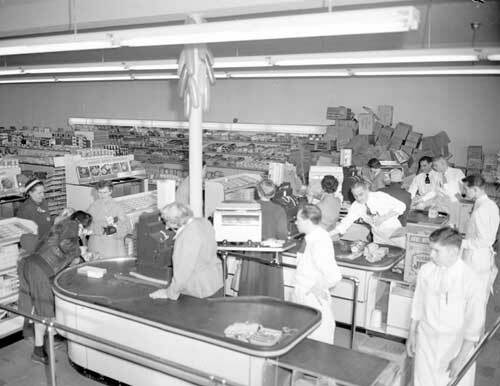 In those days the young clerks learned to "clean, stock, store and order" as well as arrange nice displays, which Wingren always believed was essential in a successful grocery business. He must have been a dependable and hard worker, because by the late 1920s young Paul Wingren had become a minor cog in the big corporate wheel of the United Groceries and Markets in the Seattle area. In late 1929 his boss asked him if he would be interested in taking over a small branch grocery in Ketchikan for just one year. That was at lunchtime on a Thursday, records indicate. Two days later an eager 21-year-old Paul Wingren was aboard the steamship Alameda, headed for Alaska. He stepped off the ship on the downtown dock and hailed a cab to take him to the new store location's address, 344 Front Street. Wingren later told a story of getting a pretty good look at the town, being driven all over before being delivered to his destination -- less than two blocks from the dock! The location was in the Zimmerman Building, home of today's borough offices. The new groceryman lasted a year but that was all. By then the effects of the Great Depression that began in 1929 had seriously worked its way to Ketchikan. The joke in those years was that Ketchikan folk ate so many clams their stomachs could tell when the tide rolled in and out. And after that first lean year, Paul's new store failed, it went broke and finally closed. But Paul Wingren may have glimpsed his own future, because he stayed on in his new hometown. At that time a couple named Don and Cora Armour owned the Piggly Wiggly grocery in the street level of the Gilmore Hotel. They bought Paul's defunct business practically next door and became Wingren's new bosses. The name was shortened to a generic United Grocers. Even in those early years after his arrival in Ketchikan, Paul Wingren dove wholeheartedly into community affairs. He had brought with him to Ketchikan his family's unique and antique big-wheel bicycle ­ a velocipede he could actually ride! And he rode it in every community celebration the town had, especially the traditional big bash and parade on the Fourth of July-- Paul dressed in a suit of stars and stripes like Uncle Sam. To the adults as well as the hometown boys and girls from he past, many long since gone, Wingren was the "the long-legged man dressed in the Uncle Sam suit who rode the old-fashioned big-wheel bicycle in Ketchikan's parades!" That well worn costume, at some time tailored from better-than-costume fabric, was recently donated to the Ketchikan Museum. The antique big-wheel bicycle, originally brought to the Pacific Coast from Wisconsin by Wingrens' father, now belongs to his son, Jerry, who lives in Colorado. Wingren managed the United Grocers store until a fire in the Zimmerman Building in 1936. The Armours decided not to rebuild, so Wingren went to work for them at the Piggly Wiggly for a time as a clerk. But while the grocery businesses kept the wolf from his door through those lean years of the Depression, something momentous was happening in young Wingren's life. A lovely young woman named Floy Close, who lived way at the other end of town at Charcoal Point (by today's state ferry terminal) had noticed the lanky Uncle Sam pedaling through town with a joy and energy that caught her attention. Attention turned to intention. The young couple saw each other at a dance and that led to marriage on Sept. 3, 1932. Mr. and Mrs. Armour were the couple's attendants. The newlyweds traveled to Juneau for their honeymoon. 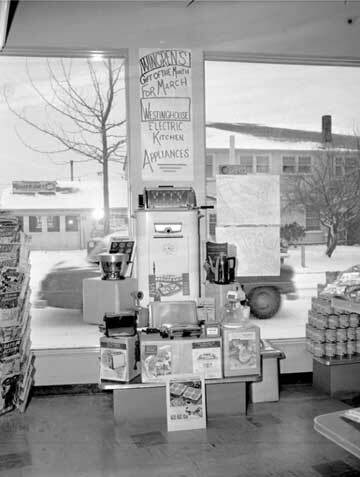 Five years later, after Paul Wingren's brother Al had come north and after Paul sold his interest in a Carlanna mink farm, the brothers started their own grocery business ­ located in the old Front Street United Grocers location -- in the after-the-fire and remodeled Zimmerman Building, 344 Front Street. Because of the shaky economic times, the brothers were "scared to death," Paul admitted in an interview many years later. He said their stock was so skimpy that the canned goods were lined up tightly shoulder-to-shoulder across just the front of the shelves, empty space in back. Wingren saved and framed a copy of the Oct. 26, 1937, Ketchikan Chronicle ­ the announcement of the grand opening that also showed the astonishingly low prices of the times. Those were the days, Wingren said, from 1937 until the economic emancipation of the pulp mill years, the days of free delivery and charge books, with totals added and scratched on a paper sack from the stack kept on the counter. Those were also the days of waiting for payment, often for some time. Ah, the old days. but Wingren was one to shrug and say, "We did okay." The years zipped by and in 1954 ­ when the West End was blossoming into a second and separate Ketchikan business district - Wingren's new and more modern grocery store moved into the ground floor of the West End's new Marine View high-rise -- still called Wingren Court by oldtimers! By then Ketchikan had became, courtesy of the pulp mill's new and energized economic climate ­ a cash-and carry town rather than a charge book town. The years flew by, and after the Port West Mall was built, Wingren in 1975 sold his grocery store to Lloyd Hames ­and then, at last, retired. Sort of. 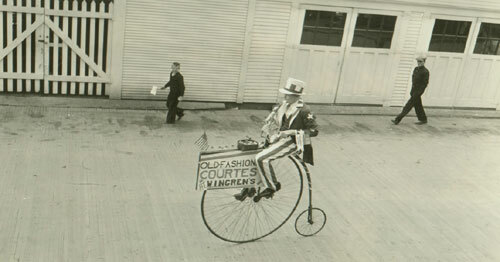 He jumped right into Chamber of Commerce plans and projects - with the same enthusiasm and determination he had when dressed as the bicycling Uncle Sam, when his long legs in red and white striped trousers pedaled that antique bicycle along Ketchikan's wooden streets, the bicycle with the sign that said, "Old Fashioned Courtesy at Wingren's." Paul Wingren was available to work wherever he could for the community. But Paul Wingren became ill and died too soon, at home on Sunday, Feb. 19. 1989. He was 80. His widow, Floy Wingren, now lives in a pleasant retirement facility in Lacey, Wash. His son Jerry is a noted sculptor living in Colorado; his daughter Marlene Scanlon is co-owner of Scanlon Studio. And his granddaughter Colleen Scanlon is, like the rest of family, active in community affairs. And Paul Wingren is still missed. Any number of oldtimers tell Paul Wingren stories, some true, some fanciful. But no one can say that the man didn't leave his mark on Ketchikan . He not only lived to see the town's positive changes; he may also have been responsible for some of those changes for the better. He loved the town - and that always helps.